The long wait…has come to an end. And today, we learned when that journey of waiting will come to an end. I only just woke up about half an hour ago. When I did, the first thing that came to my attention was a post in the Guild Wars 2 thread on a forum I frequent. As I’m the usual person who posts any news there, I had to see, out of curiosity of what could have been announced. Maybe some notes from the stress test yesterday, maybe? No, it was something far better than that. It was a release date announcement. This morning, Mike O’Brien posted up a blog post stating that the game will be launching on August 28th, 2012, and that the final BWE will be July 20-22. August 28th. That’s two months away. Only two months left! I mean…wow. With how long we’ve all been waiting for this game…two months is almost nothing. It’ll be here before we all know it. Nor more needing to speculate on when it could possibly come out. No more needing to wait. In two more months, we will have the game in our hands, and this journey will have come to an end…and a new one, our journey through Tyria, will be starting. Possibly the highlight of my weekend. So, the second beta weekend event for Guild Wars 2 has come and gone. How did it go? Well, overall, things felt a lot more polished than they did the last time around. It was obvious that they put in a lot of work over the past few weeks since the previous BWE, and really, it paid off. There were still bugs and server crashes, but as a whole things seemed a lot smoother. There are, of course, exceptions to that. There were a lot of problems with the finale, and some quibbles I had with it, though those really only apply to an event like that which I doubt will ever happen again, so they’re not a huge deal, but they’re still there. The first change that was noticed immediately upon logging into the game was that there was a UI overhaul. The minimap could now be resized and dragged around the window (and apparently hidden, which I did on accident). The energy bar, used for dodging, was now a small curved bar that wrapped the top of the health globe – I particularly liked that, as that was really something that needed to be more centered. The icon for it was also gone, which was nice – that was never necessary I thought. Icons for boons and conditions were just to the right of the health globe and seemed a bit smaller and more streamlined than before. The next thing that I noticed were the presence of tool tips. Those were lacking in the first BWE build, and it was something that I commented on before. While I never needed to really use them, the fact that they were there now was certainly very nice, and I’m sure was helpful for more than just a few people. The gem shop underwent a massive change, and I think my absolute favorite thing ever came from that change. Yes, the Box o’ Fun. 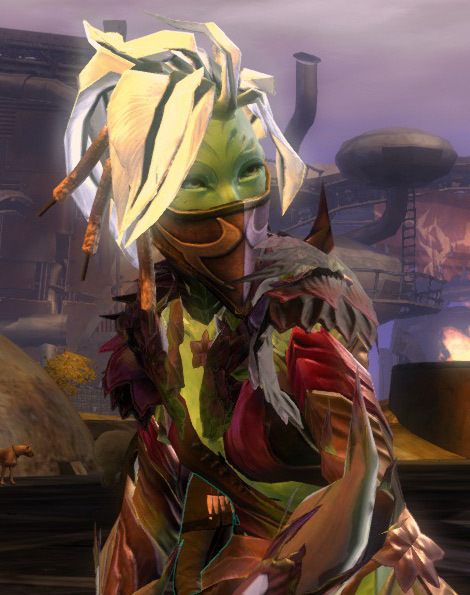 Among other things, interacting with it could turn you tiny, into a giant, invisible, into a sylvari (my favorite! ), a skritt, make you part of a snowball fight, give you fireworks, make you glow different colors, simply make you explode…we spent about an hour playing with them while waiting for the finale to begin last night. So much fun. Mesmer mechanics seem a bit more solid. Clones and shattering felt like they were actually having some effect, but still not enough to be hugely useful. I tried out the torch off-hand, which was decently fun. The Prestige is an amusing skill, though it’s usefulness is really rather limited – when you went invisible most enemies would wander away, so it wasn’t often I’d get the burning effect when it ended to actually work. Illusionary Mage is better, but sadly Confusion doesn’t seem to really do much of anything. Overall, I definitely prefer the pistol and sword as off-hands. The greatsword remained my main weapon throughout the weekend. It seems like there was some adjusting of the difficulty level on the personal story – I did manage to complete the demo version of the story. I actually very much enjoyed it – I picked street rat and missing parents for my story options, and I must admit, the end of it made me tear up. I saw it coming a mile away, but the way it was handled in-game was great. The fights themselves were certainly easier than the last time – still a challenge, but not frustratingly difficult. Dak reported the same thing for the norn storyline as well, which is good. I made and tried out a Ranger and…well, I do like the class itself. I used axe/torch and sword/torch, which I enjoyed. However, pets. Oh, those poor pets. I had Meow Mix the stalker and Mr. Giggles the hyena, and neither of them could stay alive for any period of time. Trying to keep them alive meant I spent far too much time in a fight paying attention to their healthbars instead of what was going on. Pets need to be stronger. They at the very least need to have more survivability. I also noticed that rarely would they actually do what I told them to. I’d tell them to attack, and they’d just stand there, more often than not. Rather frustrating, really. There were some events that were really difficult. The ones that immediately come to mind were the krait blood witch and the bandit foreman in Kessex Hills. The blood witch was difficult not because of the witch herself, but because of everything else that spawned there. Veteran kraits and barracudas (the latter of which spawn MORE if you don’t kill them quickly enough)…the Svanir shaman at the Maw in Wayfarer Foothills was also difficult, but really not in a fun way. The Shadow Behemoth, on the other hand, was awesome. I’m really glad I got to be in that fight, as I missed it last time around. Huge epic event which was a challenge to beat but not so difficult that it was frustrating! Edit: I’ve been informed that dye unlocks are indeed character-wide, not account-wide. Which is really odd, as my own experience was not that – I had at least one dye I unlocked on a character over the weekend that I was then later using on another. Hrmmm. As you can see, it got quite chaotic, and once we figured out what was going on, it was a ton of fun. The Shatterer even flew by overhead several times, though I never caught a glimpse of him. There were some issues, though. On my server, it happened, but it started about 15 minutes late. I’ve seen a lot of reports that on other servers, or in an overflow, it either started really late (not enough time to do anything), or didn’t happen entirely. Also, the fact that waypoints become contested and can’t be used when there’s an event battle going on near it really counted against this event, I think. All waypoints became unlocked, for ease of getting around, but half the time you had to run to where a fight was and hope you got there in time because the waypoint was contested. This also meant that I never got to fight against Rytlock, because he was near a waypoint that was constantly contested. By the end of the weekend I was level 26 and showing off an awesome set of Seraph Armor that was dyed Hot Pink (rare dye) and Ebony (starter set dye). I do hope that they let us keep these characters again for the next BWE, because I’ve become rather attached to Verene the Mesmer, and also I would really love to be able to try the Ascalon Catacombs dungeon. I meant to this weekend, but sadly didn’t quite make it. We’ll see, though! I did take lots of screencaps this time around which I’ve posted on our facebook page, though not really many videos. What changes this BWE did you like the most? What didn’t you like or think should be changed further?